Most first time car owners are usually surprised at how fast dirt accumulates in a vehicle during normal use. Scuff marks and scratches are inevitable, regardless of how safely you drive and park your vehicle. There is simply no accounting for the actions of other drivers and pedestrians that your car might get into contact with. Interior spaces also accumulate dust and debris easily. If you have small children or pets, then you can add spillages and foul odours to the problems facing your car’s interior. The first step on the custom detailing journey involves thoroughly washing your car’s exterior surfaces. This begins with a high-pressure spray that will remove any dirt, grime and debris particles from your car’s body and undercarriage. Apart from cleaning the car, this also exposes any exterior damage that your car might have sustained during its daily usage. While the pressurised power wash is good for dislodging debris particles on your car, it is not effective for grease and other contaminants that stick to the body. These are removed through a detergent clean. Car wash detergents have chemical compounds that break down grease on a molecular level. Chamois leather is the preferred drying material due to its absorptive qualities and the non-abrasive characteristics of its fibres. 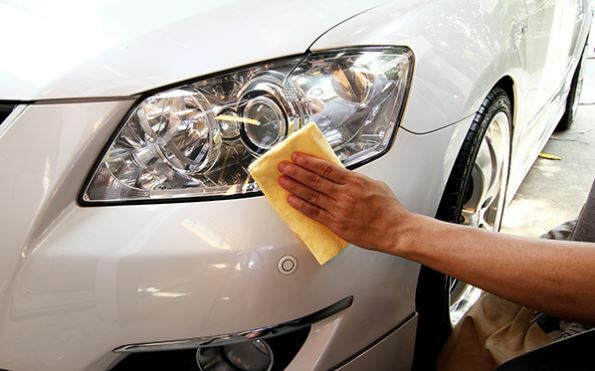 For the car polish process to be effective, your car’s body needs to be completely dry. As the body dries, the interior spaces are cleaned. All floor mats and carpets are vacuumed and power washed to remove dirt, spillages and foul odours. Car seats suffer most of the brunt when it comes to spillages, and these are also vacuumed and cleaned. Your dashboard, door panelling and other surfaces will also be cleaned during this process. Special attention is focused on interior surfaces that are made of leather or wood. The interior detailing process is usually concluded with a car deodorant that smothers any existing bad odours. While most of the interior detailing usually involves cleaning, most service providers can mend tears, cracks and other forms of damage on your seats and other interior surfaces. The wheel area, which includes the tires, mudflaps and rims, will also be addressed. A high-pressure spray is used to clean the tires and mudflaps. Rims can also be cleaned the same way, but pricier custom reams are usually hand cleaned with detergent and a soft cloth. After being dried, the rims are usually given a chrome polish to reinvigorate their natural shine. Window surfaces are also cleaned during the custom detailing process. This is a usually straightforward process that involves a soft cloth, water and window cleaning detergent. If your windows are tinted or damaged, then a more specialized plan will be put in place. Window cleaning addresses both the interior facing and exterior surfaces in your windows. In most cases, this will include your rear view mirrors as well as the exterior surfaces on your front and back lights. The boot is one of the most neglected parts of your vehicle when it comes to regular cleaning. This is despite the dirt that it is exposed to in terms of the spare tire as well as any luggage you may ferry now and then. As with the car’s interior, this will mostly involve vacuuming or a stem wash if it is particularly dirty. Deodorizing can also help since the boot space has airways linking it to your car’s interior. With the exterior surface clean and dry, wax based polish is applied to the body for increased lustre. While there are different brands and formulations depending on your needs and budget, the polishing process serves two main purposes. Firstly, it amplifies the sheen in your paint job making your car looking almost brand new. This is much cheaper than a repainting job, and usually achieves similar results. Secondly, it adds another layer that protects your car’s paint job. The polished surface will be more stain resistant and will shield your paint job from the degrading effects of the elements. Once the polish is well applied and buffed to a glowing sheen, your custom car detail process is complete.